Has your child been harmed? Some accidents are bound to happen and they can happen at any time. Your child can trip and fall, get a bump or a bruise, or a scrape or a cut. In the scheme of things, these are minor injuries that can be remedied by a bandage or trip to the doctor. If your child has been significantly harmed by someone else's negligent conduct, however, there can be few things more tragic. You never expect your child to be treated in such a way, and yet, it can happen. If your child was harmed by someone's misconduct, you could have grounds to file a claim for personal injury. 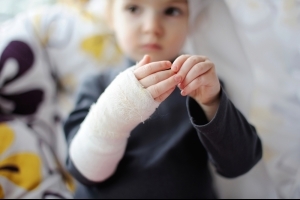 At Parr Richey Frandsen Patterson Kruse LLP, we believe that children's injury claims are the result of some of the most terrible and reprehensible acts of negligence. We have been fierce advocates of victims' rights since 1899! With more than 75 years of combined legal experience and involvement in serious high-profile cases involving personal injury, an Indianapolis personal injury attorney from our firm is ready to help you learn your legal rights, inform you of your legal options, and represent you in court to help your family obtain compensation of your child's injuries! You need to act now. Time is of the essence! Cases involving children present not only emotionally difficult issues, but legal issues as well. Specifically, laws require that any settlement for a child's injury must first be court approved. Furthermore, courts will direct where the settlement proceeds can be placed for the child. Except in cases of wrongful death, the statute of limitations on negligence claims involving children's injuries begins to run on the minor's 18th birthday. We encourage you to take action as fast as you can. The sooner you consult an Indianapolis children's injury lawyer, the sooner you can protect your child's rights, health, and well-being. In cases of children's injuries, we can pursue legal action against multiple entities that were involved in your child's injury. From harmful toy manufacturers, food distributors, to negligent pet owners, we have the tenacity and capability to prove liability and hold negligent parties responsible for the damage done to your precious child. Our fierce and aggressive approach to litigation has earned national acclaim and peer recognition. Attorney Tony Patterson has been included in the Million Dollar Advocates Forum®, an association comprised of trial lawyers who have secured million-dollar settlements for clients, and an honor bestowed on less than 1% of the practicing attorneys in the nation! In addition, personal injury attorney, Paul Kruse, has dedicated more than three decades to pursuing the maximum compensation for victims of serious injuries in Indiana, securing millions of dollars in verdicts and settlements. Contact Parr Richey Frandsen Patterson Kruse LLP to schedule your case evaluation ! Our phones lines are open 24/7, so call today! Indiana Schools Have a Duty to Protect Students from Injury While at School Recently, a state appellate court issued a written opinion in a personal injury case involving a parent's allegations against her daughter's school.